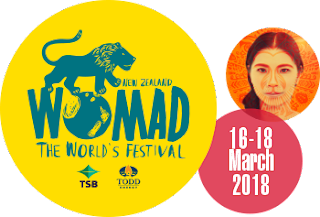 From now until 16 March Groove will be featuring one of the artists coming to WOMAD 2018. Before they became the most visible flamenco duo of the early 2000s, guitarists Rodrigo Sanchez and Gabriela Quintero bonded over heavy metal while growing up in Mexico City. They combined their talents for a time in the metal group Tierra Acida, playing around D.F. in the roughest clubs the city had to offer. Though they recorded some material, Tierra Acida never hit it big, and an album was never released. Instead, Sanchez and Quintero concentrated on learning more guitar styles, teaching lessons during the day and playing bossa novas in hotel bars at night. Bored and frustrated with their chances in the Americas, the two decided to try their luck in Europe instead. 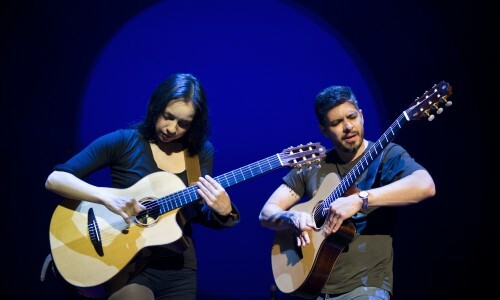 Rodrigo y Gabriela traveled to Dublin, where a friend had offered them a place to stay. The musicians spoke no English, carried little money, and upon their arrival found that their offer of European hospitality had vanished. The pair soon turned toward busking on the streets of Dublin, a move that enhanced their reputation and helped land them several contacts. Among their newfound friends was fellow busker Damien Rice, who soon asked them to accompany him on tour. The Mexican duo had, by this time, developed a large repertoire of original material in a variety of styles, and they released their debut record with 2003's Re-Foc. A concert album, Live: Manchester and Dublin, followed one year later. Rodrigo y Gabriela became the newest fixture of the world music circuit, known for their nimble-fingered guitar work and diverse background (few flamenco guitarists could boast a background in metal music). Their third album, Rodrigo y Gabriela, was released in 2006 and debuted atop the Irish charts, beating out Arctic Monkeys for the number one spot. They continued to tour, making their way through Japan (as evidenced by their second live album, Live in Japan) and America, and 11:11 expanded their discography upon its 2009 release. The duo went on a touring hiatus in September 2010 due to stress injuries to Gabriela's hand. In January of 2011, they collaborated with film composer Hans Zimmer on the score for Pirates of the Caribbean: On Stranger Tides, which was released in May of that year, followed by Live in France, a document from the 11:11 tour that, like the studio album, mixed Rodrigo y Gabriela's dazzling nylon-string guitar chops with electric six-strings for a dueling shredfest. Since their inception, the pair had always envisioned working in Cuba. They recruited pianist and arranger Alex Wilson to come up with charts for a new set of songs. Wilson and the duo worked out a set of tunes, rhythms, and charts in three days in Mexico City, then Wilson went on to Cuba to hire a band. From June through September, the duo recorded with Wilson and C.U.B.A. (Collective Universal Band Association) in Havana, with producer Peter Asher. A number of special guests joined the proceedings as well, including Anoushka Shankar, flamenco and jazz bass legend Carlos Benavent, former Testament and White Zombie drummer John Tempesta, Le Trio Joubran, and Los Van Van drummer Samuel Formell Alfonso. The resulting album, Area 52, was released in January of 2012, and the duo toured the globe in support. They were the subject of an Alejandro Franco documentary film on their formation and early years entitled For Those About to Rock: The Story of Rodrigo y Gabriela, which debuted at SXSW in March of 2014, just in time for their next studio album, 9 Dead Alive, which appeared in April 2017. New Moby Album is Coming!